City face another big game when they play Southampton this afternoon. The Saints are two points ahead of Cardiff and are looking to move themselves five points clear of the relegation zone. But a Cardiff win would take the Bluebirds out of the bottom three. 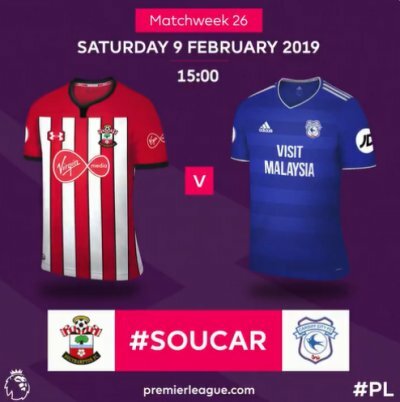 Southampton are unbeaten in their last five games and will be hoping to avenge the defeat at CCS when Ralph Hasenhuttl lost his first game in charge. But Cardiff showed their mettle last weekend by eating Bournemouth and will be no pushovers. Ings is set for around three weeks of rehabilitation from a hamstring problem. Midfielder Pierre-Emile Hojbjerg is available again after a head injury, while defender Maya Yoshida has returned from Asian Cup duty with Japan. Ryan Bertrand (back) has resumed full training, but midfielder Mario Lemina (abdominal) and forward Michael Obafemi (thigh) continue their rehabilitation. On-loan midfielder Harry Arter will be back in the Cardiff squad after he was ineligible to feature against parent club Bournemouth. Victor Camarasa is a doubt while Sean Morrison is out until March. Southampton have lost only one of their last 14 home matches against Cardiff in all competitions (W10 D3), although that defeat came in their last such meeting in April 2014 in the Premier League. Cardiff have won two of their three Premier League games against Southampton (L1), only versus Fulham (3) have they won more in the competition. Cardiff are looking to record three consecutive victories against Southampton in all competitions for the first time since March 1963. Southampton are unbeaten in five Premier League games (W2 D3), last having a longer such run between April-August 2016 (7). Southampton have both scored (11) and conceded (12) in each of their last seven home league games. Following their win against Bournemouth last time out, Cardiff are looking to win consecutive top-flight matches for the first time since April 1962. Cardiff are the lowest away scorers in the Premier League this season (7 goals), while only Fulham (2) have picked up fewer points on the road than the Bluebirds (W1 D2 L9). Cardiff's last five away goals in the Premier League have come in the 80th minute or later, with three of them coming in the 90th minute. Just one of Southampton's five Premier League wins this season have been against sides starting the day below them (3-1 vs Huddersfield). Indeed, their other four victories have been against sides starting the day in the top half of the table. All five of Nathan Redmond's Premier League goal involvements for Southampton this season have come under Ralph Hasenhüttl, with 3 goals and 2 assists in 10 appearances (after none in 15 games before that this term).